Tarragon Theatre is presenting a double bill of one-act plays by its playwright-in-residence Hannah Moscovitch. 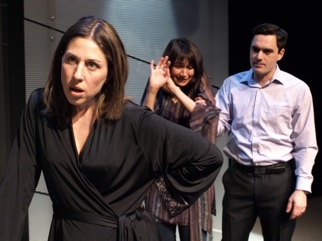 The play Other People’s Children continues through the run from February 21 to March 24. Little One plays February 21 to March 17 to be replaced the week of March 19 to 24 by In This World. Moscovitch has found a champion in the Tarragon who previously produced East of Berlin (2007), The Children’s Republic (2011) and most recently This is War (2013). Moscovitch’s advantages are an ability to choose complex situations and a facility in writing natural dialogue. Her main disadvantage is the tendency to write within the confines of genres while not always resisting the tug of melodrama. Unlike Michel Tremblay, Judith Thompson, Daniel MacIvor or John Mighton, much less a playwright like Caryl Churchill, she has yet to write a play that is not easily classifiable or that broadens the possibilities of dramatic language or what drama is or can do. In the current “Double Bill”, as it is called in the Tarragon brochure, Little One is the first play presented and is by far the stronger piece. It a mystery/thriller similar to This is War composed of direct address interspersed with scenes enacted by the principals. The play ends with a twist very similar to This is War but has the advantage of being much more compact and does not raise our expectations by choosing a current event like the war in Afghanistan only to use it merely as background. Little One is narrated by Aaron (Joe Cobden) about growing up in an affluent section of Ottawa with psychotic younger sister Claire (Michelle Monteith). Both Aaron and Claire are adopted but while Aaron is physically and mentally healthy and succeed at all he attempts, Claire manifests increasingly disturbing behaviour as she grows older that includes sexually molesting male classmates, arson, peeing in her bedroom on purpose, stabbing Aaron and killing small animals. With grim humour Aaron details how his family ineffectually copes with someone he deems a “monster” as they always hold out hope that Claire will improve after her numerous therapy sessions. Aaron eventually becomes an unwilling buffer between what he sees in Claire and what his parents are willing to believe. His patience is sorely tested when he has to give up all the activities he excels at because Claire is supposedly about to make a breakthrough. For the therapist this breakthrough would consist of remembering the horrible abuse she suffered as a child before she was taken into care and adopted. Interspersed with Aaron’s narrative and scenes enacted from it is a narrative by Claire, not clearly related in time to Aaron’s story, about her obsession with the couple who live next door. She wonders what the nature of love can be between a man and his mail-order bride from Vietnam. She secretly spies on them, even when they’re in bed, and toward the end investigates the mysterious sound that emanates from the room. Moscovitch creates dramatic tension by making us wonder what the relation is between Aaron’s and Claire’s stories. The relation is revealed by the end in the same scene that gives the whole play an unexpected but believable twist. Cobden gives a superb performance, carefully ratcheting up the conflict within Aaron between his increasingly negative view of Claire and the sacrifices he has to make for her sake versus protecting his parents by trying adopt their hope against hope that Claire will eventually become normal. Monteith has had to play so many loony young women in the past that Claire is really so stretch for her. She has become an expert at creating a frightening disconnect between the innocence of what her character says versus the disturbing content of her words and actions. Kimberly Purtell is credited with lighting design, but the light levels are so consistently low that Michael Gianfrancesco set of quilted hanging panels can hardly be seen. Director Natasha Mytnowych apparently wants the designers to give the impression that Aaron and Claire’s heads are floating in space, since Aaron’s face is often lit only by a pinspot while Claire, in a now-clichéd technique straight from The Blair Witch Project (1999), lights up her face with a flashlight. It’s a scary, unsettling little piece that has you on the edge of your seat for its hour-long length. But, as happens with many thrillers, once the lights come up the terror drifts away and you realize that there really isn’t much to discuss. As with farce, it’s the moments in the theatre with the actors that make up the play’s entire effect. Other People’s Children takes on a potentially richer subject matter – the employment of first world parents of nannies from the developing world to raise their children. With the case of the career-driven lawyer Ilana (Niki Landau) and her globe-trotting husband Ben (Gray Powell), who always seems to be dropping off or picking up his rolling luggage, we see two narcissists so absorbed by position and work that they can barely relate to each other much less to their 10-month-old daughter, Eva. Their daughter is basically another acquisition and they have hired Sati (Elisa Moolecherry), a woman from Sri Lanka with an engineering degree, to take care of her. Ben, who initially objected to the idea of a nanny, turns out to be completely satisfied with the arrangement. Ilana, however, who suffered post partem depression, hated the act of breastfeeding and is seldom home, begins to resent Sati’s increasing influence. Although she has in fact abdicated the role of mother she doesn’t admit the fact to herself and accuses Sati of usurping her role as mother. This, in itself, would make a fascinating study and has many sociopolitical implications that the Program Notes point out. Moscovitch, however, decides to cloud the issue by throwing numerous pointless diversions our way that don’t always make sense. Although Sati acts the innocent, Moscovitch tries to make us wonder, without much success, whether Sati also enjoys the power she has in the family. Ilana and Ben have quite enough issues that divide them without Ilana obsessing about Ben’s once having a full body massage “with release” in Hanoi. Given how reserved Ben has otherwise been portrayed, it’s unbelievable that he would be so stupid to have told mentioned this event to Ilana, especially since she was supposedly depressed at the time. Moscovitch could have made this a play about the plight of nannies in first-world countries. Instead, she not only does not give us much information about Sati but deliberately makes it ambiguous so that she is little more than the stereotype of the submissive Asian female. She functions more as a blank figure onto which Ilana and Ben project their fantasies and frustrations. Indeed, halfway through the play the focus shifts from Sati to Ilana and the ending has to do with Ilana one-upping Ben rather than anything to do with nannies and children. With the outcome for Sati predictable from the first scene, two disagreeable characters and one unknown, it’s difficult to care much what happens in the play. We mostly hope we will make it through the hour without any harm coming to the unseen child. The acting from the entire cast is excellent. Landau makes Ilana so neurotic that her tantrums are all too believable, to the point, in fact, that we wonder what Ben ever saw in her, what he sees in her now and why he even stays with her. Moolecherry gives Sati such warmth that Moscovitch’s odd attempts to undermine her character just don’t ring true. Michael Gianfrancesco has solved the difficult requirement of depicting two levels of a house on one small stage quite elegantly and Paul Lampert has provided direction so clear it points out the flaws in Moscovitch’s text. Photo: (top) Michelle Monteith (background) and Joe Cobden (foreground); (middle) Niki Landau, Elisa Moolecherry and Gray Powell. ©2013 Nir Bareket.